A maddy baby knitting pattern for a baby blanket, pillow, or mini pillow to knit in easy garter stitch. If you are short on knitting time for the new arrival, this is an easy-to-knit project in garter stitch. Still short on time? 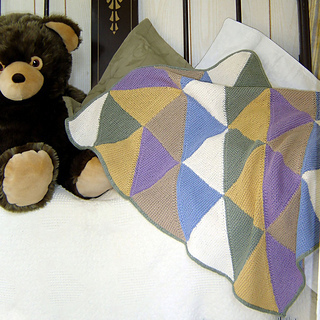 Enlist family or friends to start knitting some of the garter-stitch triangles and before you know it you will have the required number of pieces to finish up the blanket, neatly edged with knitted cording. Still not quick enough? 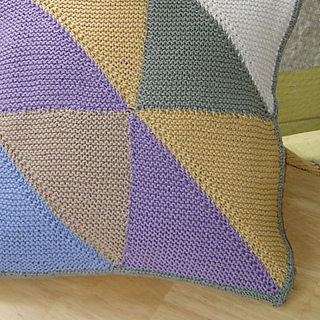 Knit enough triangles to form a pillow or better yet, a mini-pillow. One way or another this pattern will make sure you have something ready and waiting for the new arrival.